Traditionally, the impact of publications is measured by citations. However, not only does it take a while for citations to begin accumulating, they also provide a limited picture of an article's reach. For that reason, other metrics – such as readership figures, social media mentions, and captures and shares on academic networks – are proving increasingly popular. And the result is that you as authors are required to play an ever more active role in making sure your work receives the attention it deserves. That is where a new service called Kudos comes in. Readers are increasingly struggling to filter the growing quantity of published research. Information that supports the ability of users to filter their searches – such as lay summaries and impact statements – often exists but is not made public. Authors are in the best position to increase the awareness and impact of their work, but they don't always know how. Assembling and creating information to help search filtering. Sharing information to drive discovery. Measuring and monitoring the effect of both activities. Philip Gale, Professor of Supramolecular Chemistry and Head of the School of Chemistry at the University of Southampton, has been involved in the project pilot and has found the service really useful. He said: "It not only helps me improve the visibility of my papers, by highlighting them to my social network, but also provides a way of widening the audience for the work by linking a lay summary of the work to the paper." After a successful alpha release phase in partnership with AIP Publishing, the Royal Society of Chemistry and Taylor & Francis, Kudos is ready to take the next step and has signed up additional publishers, including Elsevier, for their beta phase. During this beta phase, which runs from April–December this year, we will test the tool with 22 journals. Following publication of their articles, authors from participating journals will receive an email asking them to log on to the Kudos platform. On the platform, they will be led through various steps that prompt them to explain their article; add context via links to other content such as images and data; and share their article via social networks and email. The Kudos platform, which is free for authors, allows authors to see the effect of their actions on altmetrics (via Altmetric.com) and data about the usage of their article on Elsevier's ScienceDirect. 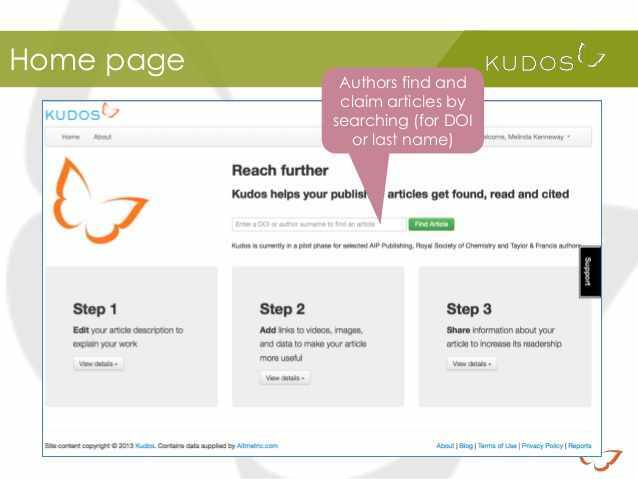 The alpha pilot site for Kudos was launched in September last year and during the three-month pilot period more than 5,500 authors registered. They have claimed articles, enhanced them with additional metadata (such as a short title and lay summary) and links to related resources, and shared them via email and social networks, which has led to increased usage of those articles. During the beta phase, Kudos is working with a much wider group of publishers, articles and authors, which will enable them to undertake more rigorous analysis of the effectiveness of the service, and to explore variables such as subscription versus open access. Last year, Elsevier's Article of the Future team launched a novel approach to helping authors ensure their research gets the attention it deserves - AudioSlides. AudioSlides are 5-minute webcast-style presentations created by the authors of journal articles. Using a blend of slides (PDF and PowerPoint) and voice-over, you can explain your research in your own words. The resulting presentation appears alongside your published article on ScienceDirect and, like the abstract, can be viewed by subscribers and non-subscribers alike. Because AudioSlides presentations are made available under a Creative Commons open-access license, you can also embed them on your personal or institutional websites. The team has also recently made it possible for you to download your presentations in mp4/movie format so you can promote them through other channels, such as YouTube, or in presentations at workshops and conferences. Since the initiative was launched, more than 1,760 AudioSlides presentations have been created.